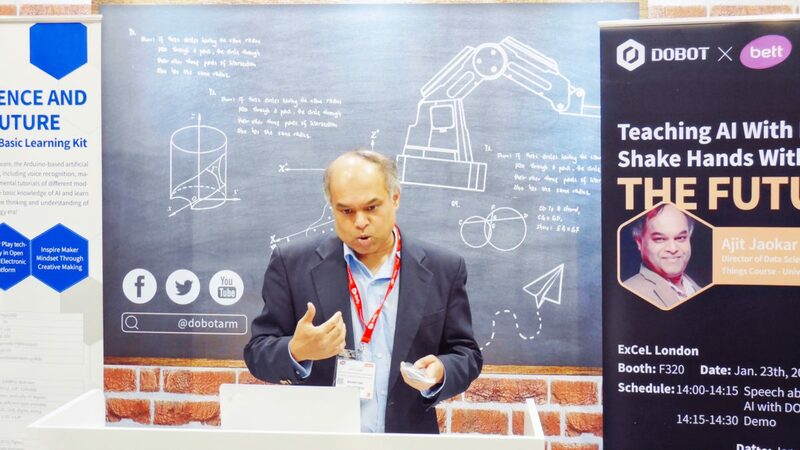 Ajit Jaokar, Director of Data science for the Internet of Things Course from the University of Oxford, showed at DOBOT Booth: F320 and delivered a speech named “Teaching AI with DOBOT” at Bett 2019, the world's largest show on education technology in London. 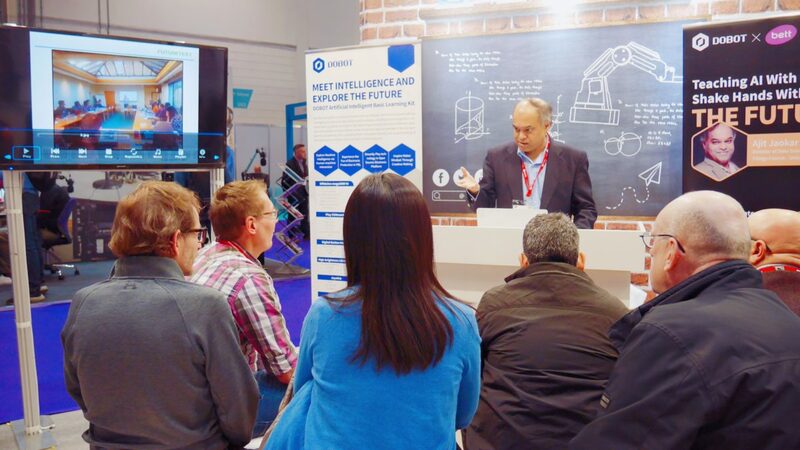 During Ajit’s speech, he elaborated on the templates, toolkits, APIs and machine learning algorithms that the course applies when teaching AI concepts and projects via using DOBOT Magician, a lightweight and versatile robotic arm. Those resources include Amazon personalization, forecasting, transcription, recognition and analysis services from Amazon Web Services (AWS), cloud vision and speech APIs of Google cloud, and vision, speech, search, language processing APIs supported by Microsoft Azure. When combined with the above resources and different toolkits, DOBOT Magician can perform various tasks ranging from moving products in a warehouse to picking and placing objects in a simulated assembly line, providing hands-on experiences and immersive teaching projects for students. In this way, both teachers and students can benefit from the adoption of robotic arms in the class. At the end of the speech, Ajit also expressed his willingness to share his teaching experiences with and learn from other visionary educators across the world. Ajit currently works as a Principal Data Scientist in the Bioinformatics space. Ajit publishes extensively on KDnuggets and Data Science Central and his book, Data Science for the Internet of Things, is included as a course book at Stanford University. Besides always being passionate about teaching data science to young people, he created a new course at Oxford University, named Data Science for the Internet of Things. The course aims to create a new kind of talents that integrate knowledge of IoT and AI to solve real and practical problems, better addressing the real and practical needs of AI and robot industry. He also established an AI lab in London, where his team can explore specific robotics/ AI deep learning technologies using robotic arms, in a way to react to the technological trends and lead in the new AI era. The current era is amid a significant transformation regarding the way products are produced thanks to the automation and digitization of manufacturing. But unfortunately, education seems to still lag behind. So teachers ought to embrace emerging technology to make teaching more intuitive, productive and responsive and apply innovative teaching tools like robotic arms to reduce workload, increase collaboration and enhance professionalism. 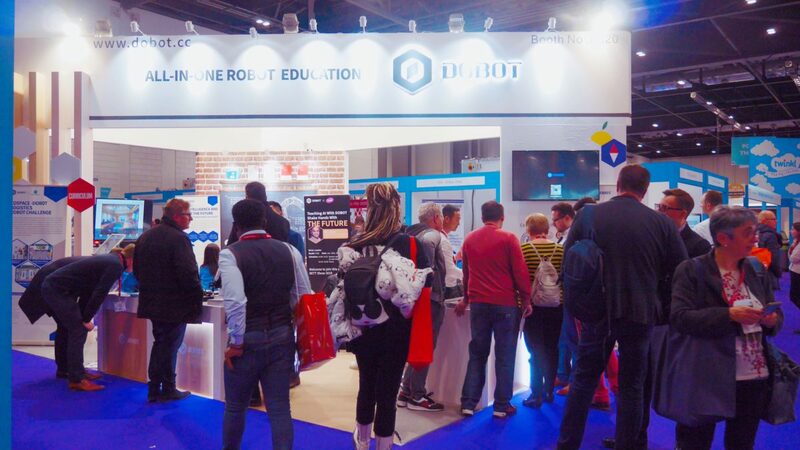 As a global leading robotic arm solutions provider for education and business, DOBOT brought its newly updated color-mixing 3D Printer MOOZ-3 and the innovative teaching tool for universities – DOBOT Magician to Bett 2019. 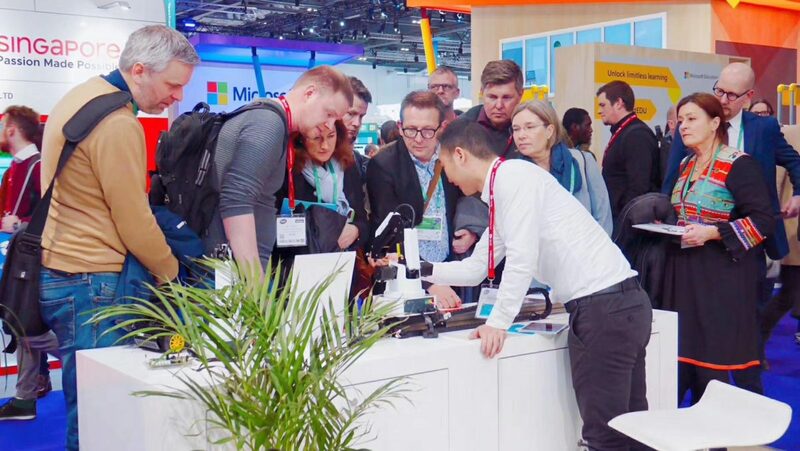 DOBOT showcased several demonstrations ranging from writing calligraphy via iPad to artificial intelligence voice recognition that once appeared in Google I/O 2017, attracting hundreds of visitors to interact with the robotic arms. This is not the first time that DOBOT participates in the show. But it is the first time that DOBOT invited an expert from Oxford University to give a talk regarding education technology based on his practical experiences. DOBOT looks forward to deepening the kind of enterprise-university cooperation with Oxford University to cover more universities and prepare their students for a future full of uncertainties. 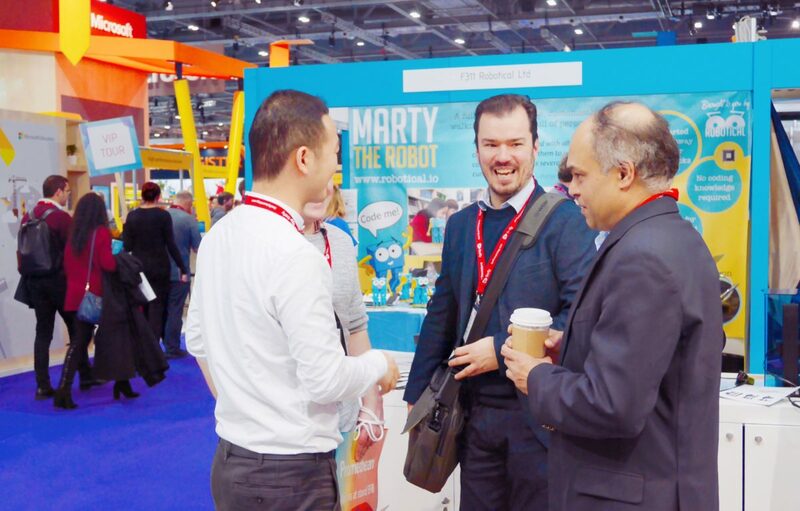 Bett or the Bett Show is an annual trade show in the United Kingdom promoting information technology in education. 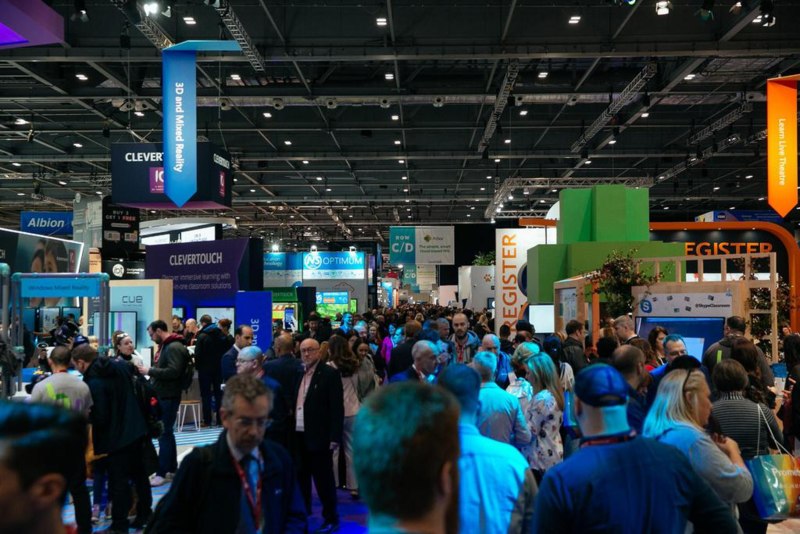 It is officially reported that over 34,000 attendees and 12,000 leaders within education from 136 countries attend the Bett 2019 this year. 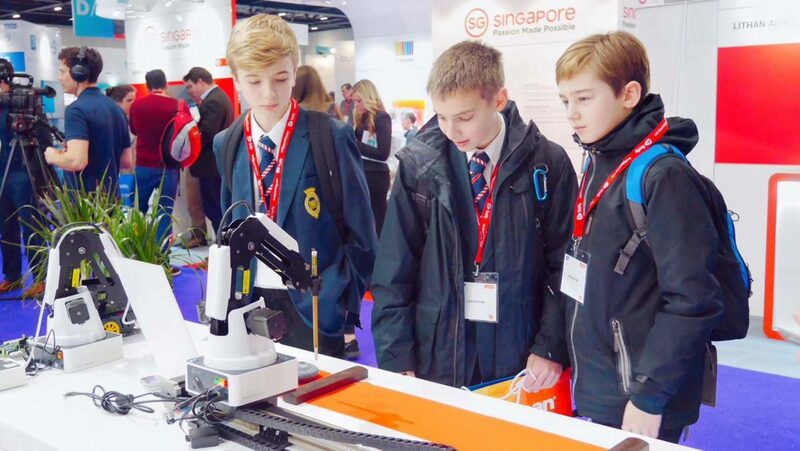 The themes for Bett 2019 are all based on the real needs of the education community, including 21st-century skills and knowledge, classroom tech and resources and innovative teaching methods that can help students be ready for an uncertain future.